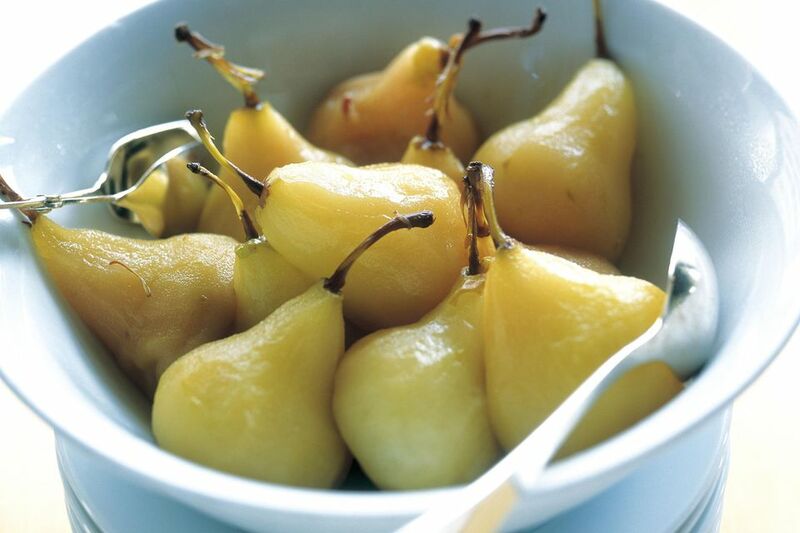 Poached Pears in White Wine is a special dessert, healthy and low fat and also so, so easy to make and absolutely delicious to eat, so everyone can enjoy them, which is possibly why they are a mainstay on nearly every French restaurant’s menu. Pears are one of the best fruits to poach as the flesh stays firm, so the pear keeps its shape and with so many pear varieties you can change each time for different flavors and textures. There endless ways to serve the poached pears but a classic is with a bit of crème patisserie or almond glace for a richer treat – the cream perfectly accents the spiced wine syrup and sweetness of the pears. Not to be ignored is pears dipped in chocolate, these are classicly called poires belle helene. Start by preparing the pears: thinly peel the pears making sure you keep the stem intact. If the pears are wobbly on the bottom, you can trim them slightly to make them flat and enable them to stand up in the pan and when serving. Stir together the sweet white wine, water, cinnamon stick, vanilla bean, lemon zest, and lemon juice in a large saucepan. Bring the mixture to a simmer over medium-high heat and add the prepared pears. Poach the pears, uncovered, for 7 to 9 minutes, until they turn tender; you will need to watch this process carefully as you do not want the pears to be mushy or they will collapse. Take them from the poaching liquor sooner rather than later. Use a large slotted spoon to transfer the pears to a serving plate. Return the poaching liquid to a simmer, add the sugar, and allow the mixture to reduce by half in volume, this will take about 6 to 8 minutes. The syrup is ready when it is thick enough to coat the back of a spoon. Remove the cinnamon stick and vanilla bean from the syrup and strain the liquor through a fine sieve. Arrange the pears on individual serving plates and drizzle with the wine syrup. You can ring the changes in this recipe by switching the variety of pear you use; with many different ones you can create different tastes, sweetness, and textures. Use a dry white wine rather than sweet; this will radically change the flavor from syrupy sweet to a drier yet still sweetish taste to the pears.